Dr. King Schultz (referring to the bounty hunter profession): Like slavery, it's a flesh for cash trade. DJANGO UNCHAINED? More like Tarantino unchained, if you ask me. When watching a Quentin Tarantino movie, there is always a danger that his undeniable genius will fall prey to his also undeniable ego. He often walks the fine line between these two elements with surprising grace and subsequently makes insightful works that are distinctly his style. 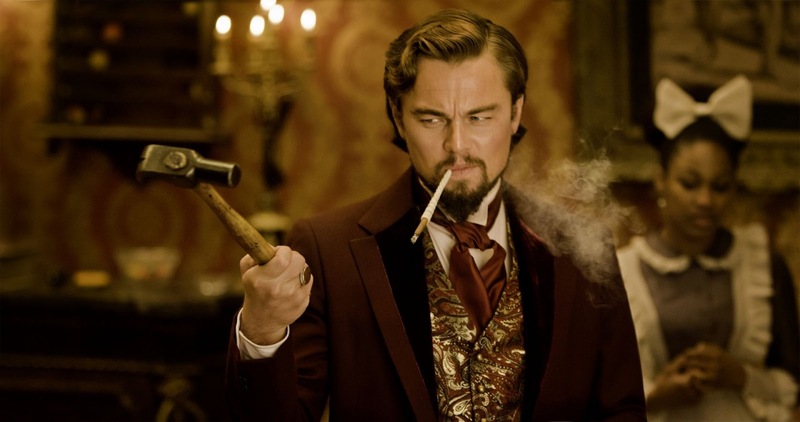 In DJANGO UNCHAINED though, Tarantino's attempt at a Western / Blaxploitation hybrid, he veers too far off course and ends up losing his edge in the sprawling drawl of the Old West. DJANGO UNCHAINED is a bounty hunter, buddy western for about an hour and then a hyper violent, romantic quest for about two hours after that. The two parts did not come together for me but either way, I never felt that Tarantino was ever truly able to make himself fit into these genres. There are moments where his unique style feels perfectly suited to the subject, but it often times felt more forced than anything else. Christophe Waltz, who embodied Tarantino's spirit so perfectly in his Oscar-winning turn in INGLORIOUS BASTERDS, is completely miscast here. As a German dentist turned bounty hunter in 1858 Texas, he is more device than character, allowing Tarantino to incorporate his particular brand of dialogue to the period, justified by Waltz being foreign. You may delight in some of the things he has to say but I found it just exposed Tarantino's unease with the period. Waltz acquires a slave by the name of Django (Jamie Foxx) at the onset of the film. He is sympathetic to the plight of the American slave but that doesn't stop him from purchasing Django for his own gain. 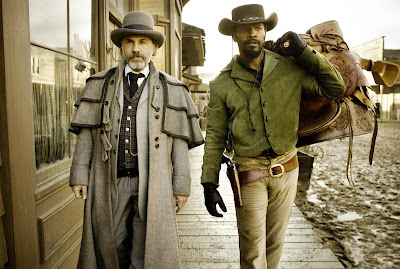 When he sees how cruelly Django is treated by the people they encounter, he sets him "free" and the twosome become the biggest, badass bounty hunters around. There is a sense of shock in just how appalling people are towards their black slaves and Tarantino is here to rescue them. 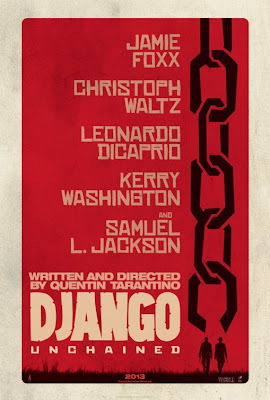 In this sense, DJANGO is no more than an extension of what he was going for in BASTERDS. Only instead of the Jews rising up against the Nazis, now Tarantino rewrites the history of the black slaves, giving them a hero to rise up against their oppressors. Along the way, Waltz and Foxx come across Leonardo DiCaprio, a plantation owner reputed for fighting his slaves to their deaths. This man owns Django's wife (Kerry Washington). And when it comes time for Django to take back what is his (which is a whole other form of slavery, but no matter), everything ends in a seemingly never-ending blood bath, that plays out more like a video game, where the goal is to kill as many white supremacists as possible. It isn't triumphant though, just incessant and relentless. You can almost feel Tarantino's smug sense of satisfaction in the end but it's misguided. You cannot rewrite the wrongs of history by just shooting the crap out of them and thinking yourself a hero for having done so.